"It has no hands....what does that mean?" When Ingmar Bergman made a splash upon the world of cinema with The Seventh Seal, there was great expectation as to what he would produce next; did he have only one such film in him, or would he prove to be a major force in the motion picture? With his followup, Wild Strawberries, through its unrelenting examination of a life, Bergman cemented his reputation and laid the groundwork for his future career. Isak Borg, a professor of medicine (Victor Sjöström) is scheduled to receive an honorary degree in Lund. Awakening from a disturbing nightmare, he decides on impulse to drive from Stockholm instead of flying. He takes his daughter-in-law Marianne (Ingrid Thulin) with him, and along the way picks up a number of hitchhikers. As he travels, he engages in a series of reveries, daydreams and nightmares as he relives moments from his life, reluctantly (and unconsciously) taking stock, trying to ascertain where things went wrong both for him and his son Evald (Gunnar Björnstrand). The opening nightmare is a completely classic piece of filmmaking, shrouded in Freudian symbolism yet utterly unnerving even to viewers who are not conversant with these symbols. Clocks without hands, runaway hearses and mysterious coffins are shot not in the clichéd murk and fog, but in harsh, bright daylight. The hearse and coffin episode not only recalls Sjöström's own The Phantom Carriage, but the dream sequence in Carl Dreyer's Vampyr (1932) as well. Bibi Andersson serves as both Sara, an alternately ingratiating and annoying hitchhiker, and the lost love Sara of Isak's memory. Through this dual role, there is an inescapable mingling of memory and the present, simulating the aging process through cinematic technique. Intriguingly, the daydreams of the past often include scenes that Isak did not and could not have seen; this marks the confusion of fantasy and memory that even today is headline material with the acknowledgement of the problems in memory recovery therapy.Sjöström is utterly perfect in the central role; as a silent film actor and director (The Wind, The Phantom Carriage), he knew how to use his face to convey more than words. Aiding him in his expression is the fact that his face is the very definition of craggy, seamed with countless lines and creases of care, and the seeming weight of centuries. The great Max von Sydow also has a tiny role, almost a cameo, as a gas station attendant, but he makes the most of it and the sequence ultimately becomes one of the more memorable of the film, as he speaks glowingly to Isak, who continues to drift off. 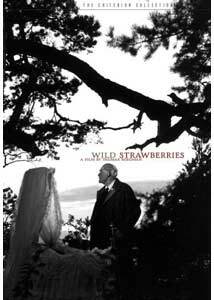 The wild strawberries of the title, like Proust's madeleine, serve as the catalyst for the flood of memories, through the disappointments of love and the nagging humiliation of guilt. Take the trip along with Bergman, and see if you don't discover something about yourself as well. Image Transfer Review: For the most part, the image is excellent. Bergman's blacks and whites are well-rendered, with rich, deep and solid shadows. Detail is quite good and a wide range of greys is present. The picture is presented in its original full frame aspect ratio. The one drawback is the presence of a couple of brief freezes that are inappropriate (e.g., at 1h:30m:15s). These are not layer changes, since the film is presented all on a single layer. It's possible that these instances were an attempt to skip over damaged frames, but they're frequent enough to be somewhat distracting. Audio Transfer Review: The 1.0 mono track is quite good as far as dialogue is concerned (I don't understand Swedish, but it seems more or less clear). The strings in Erik Nordgren's score at times have a tendency to be rather strident and harsh, though not in a particularly appropriate manner. Bergman's use of sound is notable, and it generally comes across well here, particularly in the dream sequences. Extras Review: The central extra is a full-length, screen-specific commentary from film scholar Peter Cowie, who also did the same for The Seventh Seal. His comments, while a shade dry in delivery, are consistently insightful and informative. Anyone new to Bergman will find this disc to be an excellent introduction. The other important supplement is a 90-minute television documentary of conversations with Bergman. The focus is supposedly on Bergman's life and work, but it doesn't deal with particular films so much as his own history and his methods of writing. The latter could have been better, though, since it tends to dwell on superficialities (the pads of paper and the pens he uses) rather than his actual process of writing. I found this to be a bit on the disappointing side, but it does provide some useful biographical information not touched upon by the commentary, so the two are nicely complementary. Wrapping up the package is a set of about 30 stills. These are mostly behind-the-scenes shots. Happily, they include good descriptions identifying cast and crew who appear in them, a feature generally lacking in such stills galleries.The description on the case of "Optimal image quality: RSDL dual-layer edition" is slightly misleading. The main film only occupies one layer; the documentary occupies the other. This note seems to imply two layers being devoted to the main picture. However, as noted above the image transfer is quite good so this is a small quibble. Chaptering is good for a picture of this length. The newly-translated subtitles manage to walk the tightrope between sounding dignified yet natural without being overly colloquial. They do not intrude unnecessarily; indeed, they bear the highest compliment one can give to subtitles: you forget completely that you're reading them! This disc to me more than any other is the archetypal Criterion Collection disc: a classic foreign film, with a sparkling new transfer and bountiful extras to help make the picture, at its heart, accessible. Criterion brings this off very well indeed here. Highly recommended.